The guy's workbench is making a comeback. No longer delegated to the garage or backyard studio, the classic and sturdy sawhorse table is finding its way into men's offices across the country... and we're liking the change. Ah, if only all men could keep their desks this clean... 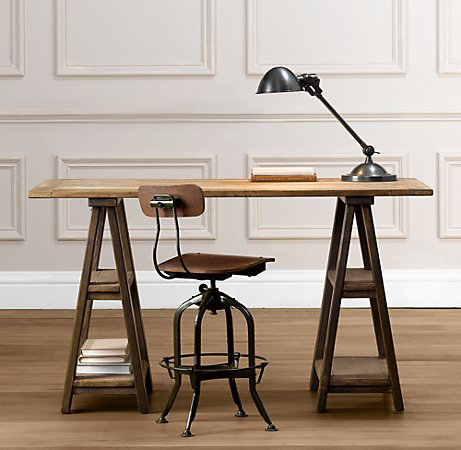 I love the industrial look of this sawhorse desk by Restoration Hardware. The old school stool and desk lamp are the perfect touches too. The great thing about this look is that it's relatively inexpensive. West Elm, CB2 and Restoration Hardware sell their versions for great prices but you can also buy the legs at your local Home Depot and add your own top. My friends used a vintage door to lay atop, which looked amazing. Great design never has to be pricey... you just need to be inspired.